1. The History and Significance of the Problem. The question “Cur Deus homo?” [“Why did God become man?—Trans. ], as is well known, was brought to the very forefront of theological debate by Anselm of Canterbury, in the eleventh century, in his famous work of that name. The equally well-known answer that he gave to this question is that Christ became incarnate in order to redeem man from sin. This notion was indispensable for Anselm’s entire system and was used as a basis for his juridical teaching concerning redemption. What Eastern theologians noticed, and correctly reacted against, is Anselm’s juridical theory of satisfaction. However, proper attention has not yet been given, in our own more recent times, to the very answer that Anselm gave to the question, that is, to the thesis that God became man in order to redeem man from sin. This thesis has passed, without discussion, into our own contemporary theology, preaching, and ecclesiastical and spiritual life, with very serious consequences, as will become evident in what follows. In the thirteenth century, Duns Scotus, in the West, challenged Anselm’s response, and, placing the question in the context of his own reflections concerning the will of God, advocated the view that the Incarnation was independent of the Fall and, in accordance with the scheme of Divine prædestinatio [predestination], would have occurred in any event. The true axis on which the Orthodox Tradition locates all the truths of the Faith, spiritual life, and all ecclesial realities is the axis of Creation-Deification, or the Kingdom of God, or the realization of the purpose of creation, or whatever else we call it. The limitation of this axis solely to the Fall-Redemption polarity leads to a mutilation and distortion of the truths of the Faith, of the content of spiritual life, and of the various dimensions of the Church. The alterations that eventuated in Western Christianity in all of these spheres after the eleventh century were inevitable. The attempt made by Duns Scotus did not succeed, first because he was working within an already-established framework, but primarily because Scotus posed a theological question—whether the Incarnation constituted the purpose of the Word—, whereas the question is exclusively anthropological and cosmological: whether it was possible for man to achieve his purpose—to be saved—without being united with God and enhypostatized in the Word; whether the created realm could attain to its fullness without becoming the body of the Word. It is not without merit for the significance of this issue to point out that Professor Dumitru Staniloae immediately adopted my proposition in his review of Ζῶον Θεούμενον, and that Professor Panagiotes Chrestou, in his important study “Ἄνθρωπος ἄναρχος καὶ ἀτελεύτητος — ᾿Απὸ τὴν ἀνθρωπολογία τοῦ Μαξίμου Ὁμολογητοῦ” ["Unoriginate and Unending Man: From the Anthropology of Maximos the Confessor"] (Κληρονομία, Vol. XII, No. 2 , pp. 251-281), interprets the crucial passages of Maximos in an anthropological, not a theological perspective, though without reference to the aforementioned proposition. We will return to the problem of confining the Divine Œconomy to the Fall-Redemption polarity and its tragic consequences. It needs to be stated, in concluding this introduction, that it was our study of the texts of Nicholas Cabasilas that led us to pinpoint this problem, and that it was through him that we arrived at our reinterpretation of the texts of St. Maximos the Confessor. It is our concern, here, to speak about the Divine Cabasilas. We WIll not deal with Cabasilas’ life or his personality. Enough has already been written about the theological profundity, the Christlike demeanor, and the noble modesty of this holy man. Although he played an important rôle in every facet of the public life of his day—political, social, cultural, theological, and spiritual—, this very modesty caused him, concerned as he always was with the essence and not with the superficies of problems, to remain so inconspicuous that today we cannot determine with precision either the time of his death (after 1391) or whether he was Ordained a clergyman, tonsured a monk, or remained a layman to the end of his life. An objective investigation of the data compels the honest scholar to leave the matter open, in the hope that new evidence will emerge from hitherto unknown sources. Two facets of his public life are of interest for our subject. First, his relationship to the intelligentsia of his era, and especially the Westernizers. His intimate friendship with Kydones,5 and also his personal interests—chiefly in his youth—led him to pay close attention to the fascination that Western theological thought exerted on the circle of Western-minded intellectuals. He followed step by step the translation of the Summa contra gentiles [by Aquinas—Trans.] that Kydones was producing. Thus, Cabasilas was informed about developments in the West. This is demonstrated also by a careful study of his works, even though, for reasons that we will explain, he rarely refers directly to Western teachings. This knowledge is important with regard to the relationship of Cabasilas to St. Gregory Palamas and, more generally, to the Hesychast controversy. Enough has been written about this issue, too. Our conclusions so far may be summarized as follows. First, that Cabasilas had a profound knowledge of the teaching of Palamas— indeed, he had been a close disciple of his for nearly a year on the Holy Mountain. 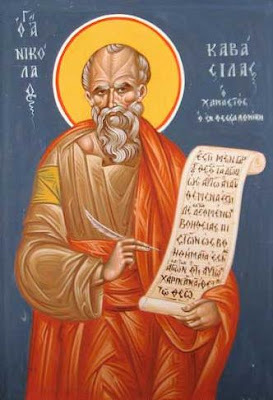 However, since Palamas’ battle had in essence been won—Cabasilas was some fifteen years his junior—he did not deem it expedient to become actively involved in the controversy, although he dedicated his efforts to transmitting the deep dogmatic truths formulated by St. Gregory to the broad ecclesiastical public. Thus, he became a pioneer in the transmission to the people of the great Hesychast renaissance of the fourteenth century as a liturgical and spiritual renaissance—a work of obvious importance. The second conclusion has to do with theological terminology and all that this entails. It is well known that St. Paul categorically and decisively defined union with Christ as the core and purpose of Christian life. No ancient heretic has dared, and no Christian confession today dares to call this purpose into question. Nevertheless, it was disputed early on that Christ is God. The thesis that Christ is a creature, aside from placing the foundation of the Faith, the truth of the Holy Trinity, in doubt, also jeopardized the salvation of man. For, if Christ is a creature, man is not united with God through union with Him. To the first aspect of this danger the Fathers responded with the dogma of the Nicene Synod, and to the second by interpreting Paul’s phrase “to live in Christ” as true and real deification. The doctrine of deification subsequently saw great and brilliant elaboration as a genuine expression of Orthodox Christianity, and St. Gregory Palamas very clearly upheld it and wonderfully expounded it in confronting the Arianizing heresy that man is united with created Divine Grace. Cabasilas was in total agreement with Palamas, but at the same time, he brought the terminology of the Apostle Paul back to the theological forefront and, proceeding further along these lines, interpreted deification as true and real Christification. By this inestimably important shift, aside from linking the struggle for deification with the Mysteriological (Sacramental) life of the Church, and showing with repeated, penetrating, and extraordinarily realistic observations that all believers can attain to the heights of deification, regardless of whether they live in the desert or in the world, he brought the discussions between Christians back to their Biblical foundation—a momentous achievement. Moreover, in anticipating the times and offering, especially to us twentieth-century Orthodox, I would say, the practical content of deification, he safeguards us from employing deification as a nebulous and indeterminate concept, as a mere slogan. But the subject that we are treating here requires us to indicate a third aspect of Cabasilas’ relationship to Palamas. St. Gregory in the fourteenth century was confronted with the suppurating sore of Barlaam. He opened the wound, dissected the problem, revealed and overcame the heresy of the doctrine of created energies and created grace. He was faced with an immediate and deadly peril, and by God’s Grace he saved Eastern Christianity from heresy. But the Westerners’ doctrine of created grace is an inevitable symptom of the truncation of the axis of Divine Œconomy from Creation-Deification to Sin-Redemption. St. Gregory saw this very grave symptom and dealt with it. Cabasilas, protected from the rear thanks to Palamas’ victory, was able to see the problem in its entirety and its essence; and with his distinctive sobriety and profundity, he confronted it as a whole. Thus, just as Athanasios was succeeded by Basil and Gregory the Theologian, we might say, Palamas was succeeded by Cabasilas—not to compare one with another, but to make a simple analogy. And just as we cannot comprehend the fourth century by studying Athanasios alone without the Cappadocians, or by studying Gregory of Nyssa in isolation from the other Cappadocians, in the same way our knowledge of the fourteenth century is inadequate—we would venture to say, totally inadequate—if we study Palamas alone without at the same time studying Cabasilas in depth. Palamas revealed the depth of the Orthodox Faith with incomparable insight. Cabasilas endowed this depth with the breadth and ecumenicity that befitted it. His accomplishment consisted in relocating all of the theological, spiritual, and ecclesial realities of Christianity along the axis of Creation-Deification or perfection in Christ; and his primary instrument was the Orthodox response to the fundamental question of why God became man. After the foregoing historical orientation, it is time to deal with the theological problem in and of itself, as Cabasilas resolved it. We shall focus our inquiry on one fundamental passage in his oeuvre. 2. Ibid. ; Nikos Nissiotes, Προλογόμενα εἰς τὴν θεολογικὴν γνωσιολογίαν [Prolegomena to Orthodox Gnosiology] [Athens: 1965], p. 67; Andreas Theodorou, "Cur Deus Homo? Ἀπροϋπόθετος ἢ ἐμπροϋπόθετος ἐνανθρώπησις τοῦ Θείου Λόγου"; ["Cur Deus Homo? Was the Incarnation of the Divine Word Unconditional or Conditional? "], Ἐπιστημονικὴ ᾿Επετηρὶς τῆς Θεολογικῆς Σχολῆς τοῦ Πανεπιστημίου ᾿Αθηνῶν, Vol. XIX (1972), pp. 297-340; Artemije Radosavljevic, Τὸ μυστήριον τῆς σωτηρίας κατὰ τὸν ἅγιον Μάξιμον τὸν Ὁμολογητήν [The Mystery of Salvation According to St. Maximos the Confessor] (Athens: 1975), pp. 181-196. 3. Ζῶον Θεούμενον—Προοπτικὲς γιὰ μιὰ ὀρθόδοξη κατανόηση τοῦ ἀνθρώπου [The Deified Creature: Perspectives on the Orthodox Understanding of Man] (Athens: Ekdoseis “Epopteia,” 1979). For an English version, see Deification in Christ: The Nature of the Human Person, trans. Norman Russell (Crestwood, NY: St. Vladimir’s Seminary Press, 1987). 4. Feast of the Annunciation of the Theotokos, March 25, Doxastikon at the Praises. 5. Demetrios Kydones (ca. 1324-ca. 1398), who translated several works by Thomas Aquinas into Greek and who subsequently converted to Roman Catholicism—Trans. 6. In our works: Προλεγόμενα εἰς τὴν μελέτην Νικολάου τοῦ Καβάσιλα [Prolegomena to the Study of Nicholas Cabasilas (Athens: 1968), p. 84 (also in the Θρησκευτικὴ καὶ ᾿Ηθικὴ ᾿Εγκυκλοπαιδεία, Vol. XII, cols. 830-857); Ἡ Θεομήτωρ, κείμενο, μετάφραση, εἰσαγωγή, σχόλια στὶς Θεομητορικὲς ὁμιλίες τοῦ Ν. Καβάσιλα [The Mother of God: Text, translation, introduction, and notes on the homilies on the Mother of God by N. Cabasilas] (Athens: 1968), p. 232; “Ἄνθρωπος καὶ Θεάνθρωπος” [Man and God-Man], Κληρονομία, Vol. III (1971), pp. 111-124; “Ἡ Μητέρα τοῦ Θεοῦ καὶ ὁ θεοκεντρικὸς ἀνθρωπισμός” [The Mother of God and theocentric humanism], Γρηγόριος Παλαμᾶς, Vol. LVI (1973), pp. 324-328; “Ὁ θάνατος τοῦ Θεοῦ καὶ ἡ ἀνάσταση τοῦ ἀνθρώπου” [The death of God and the resurrection of man], reprinted from Κοινωνία, Vol. V-VI (1974), p. 16; Ἡ περὶ δικαιώσεως τοῦ ἀνθρώπου διδασκαλία τοῦ Νικολάου Καβάσιλα. Συμβολὴ εἰς τὴν ὀρθόδοξον σωτηριολογίαν [Nicholas Cabasilas’ teaching on the justification of man: A contribution to Orthodox soteriology] (Piraeus: 1975), p. 184; “Αἱ θεολογικαὶ πηγαὶ Νικολάου τοῦ Καβάσιλα. ᾿Αναφοραὶ καὶ ἐξαρτήσεις” [The theological sources of Nicholas Cabasilas: References and supporting materials], Κληρονομία, Vol. VII, No. 2 (1975), pp. 327-344; “Ἡ ἕνωση μὲ τὸ Χριστὸ κατὰ τὸν Νικόλαο Καβάσιλα” [Union with Christ according to Nicholas Cabasilas], Ἐποπτεία, No. 27 (October 1978), pp. 773-781; “Ἡ ἐν Χριστῷ δικαίωσις τοῦ ἀνθρώπου κατὰ τὸν ᾿Απ. Παῦλον” [Man’s justification in Christ according to St. Paul], in Χαριστήρια εἰς τιμὴν τοῦ Μητροπολίτου Γέροντος Χαλκηδόνος Μελίτωνος [Festschrift in honor of Metropolitan Meliton of Chalcedon] (Thessaloniki: 1979), p. 320.